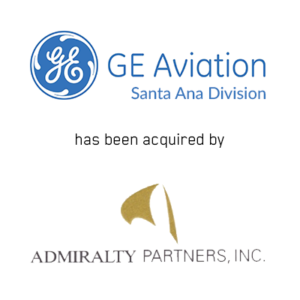 Irvine, CA (January 1, 2017) – Janes Capital Partners is pleased to announce that it served as the exclusive financial advisor to General Electric Company, acting through its GE Aviation business unit, in connection with the sale of GE Aviation Systems LLC’s Santa Ana operations (the “Business”) to an affiliate of Admiralty Partners, Inc. The Business, which will be known as Integral Aerospace, LLC going forward, is a leading manufacturer of flight critical parts for military and commercial aircraft. It specializes in landing gear components, carbon fiber filament-wound external fuel tanks for U.S. Navy aircraft, fuel pumps and other complex machined structures. GE Aviation, Santa Ana is a leading manufacturer of flight critical products on strategic aerospace and defense platforms. Founded over 50 years ago, the Business has a long history of serving the aerospace and defense industry from its 270,000 square foot facility in Santa Ana, CA. Based in Irvine, CA, Janes Capital Partners is a leading boutique investment banking firm focused solely on the Aerospace and Defense industry. The firm provides mergers and acquisition advisory services and assists clients seeking to execute growth strategies and liquidity events. With a cadre of former bulge bracket investment bankers, successful A&D executives, skilled engineers and decorated military personnel, the members of Janes Capital Partners have completed more than 75 successful A&D transactions and $4 billion in closed transaction value. Securities transactions are conducted through JCP Securities, Inc., a registered Broker/Dealer, member FINRA/SIPC, and registered Investment Advisor.